The former Director of the Terrorism Investigation Division (TID) Deputy Inspector General of Police Nalaka de Silva was remanded until November 7 by Fort Magistrate Lanka Jayaratne yesterday evening. The Criminal Investigation Department arrested Nalaka de Silva yesterday following interrogations. The former Director of the TID was questioned by the CID on four separate days previously. 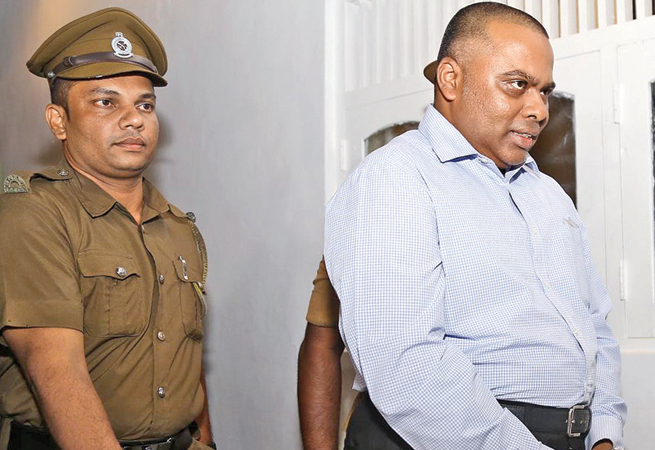 Nalaka de Silva has been allegedly accused of plotting to assassinate SSP Prasanna Alwis, the President and a former Defence Secretary. Anti Corruption Movement Operations Director Namal Kumara earlier revealed that the former director of Terrorist Investigation Division DIG Nalaka de Silva discussed with him an alleged plot to kill some political leaders. Criminal Investigations Department officials on October 23 informed Fort Magistrate Lanka Jayaratne that the voice recordings of telephone conversations between former Terrorism Investigation Department (TID) DIG Nalaka Silva and Anti Corruption Movement Operations Director Namal Kumara matched. On that occasion investigators cited that some data of Namal Kumara’s mobile phone has been deleted and they cannot be retrieved as the department does not have the necessary technology . Investigators also disclosed that Namal Kumara had served in the Sri Lanka Air Force and later joined the Sri Lanka Army without being discharged from the Air Force. The CID told court that Namal Kumara had later served at the Avante Garde Security Service too and an investigation is being carried out into Namal Kumara. The Law and Order Ministry, which acted immediately following revelations of the alleged plot, had recommended the National Police Commission to send Mr.de Silva on compulsory leave. Later, the NPC approved the recommendation of the minister.